Aspergillosis is an infection, primarily affecting the lungs, resulted from fungus, called aspergillus. The Aspergillus fungus is usually found on food, around the house, on the body, and in compost heaps. Some individuals have allergic reactions to the fungus. Aspergillosis happens when the aspergillus bacteria on a body surface invades the deeper tissue, such as lung or ears, especially in individuals with bronchitis or tuberculosis. 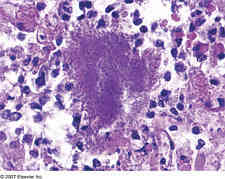 Aspergilloma (fungus ball) may grow in the lung. The ball consists of white blood cells, blood clotting fibers, and tangled fungus fibers mass. It slowly enlarges and destroys lung tissue in the process. 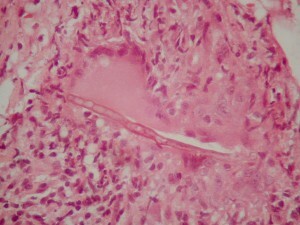 In individuals, who have supressive immune system, such as people with transplanted liver or heart, Aspergillosis may spread through the blood to kidney and brain. Ear canal Aspergillosis results in itching and, sometimes pain. Fluid draining from the ear overnight can leave a stain on the pillow. The lung’s fungus ball can result in no symptoms and can be detected by a chest x-ray. It can, however result in repeated blood cough-up, and very seldom, extreme, even fatal bleeding. Deeper tissue infection makes an individual very ill. Symptoms, such as blood clots, delirium, shock, chills, and fever occur. An individual can progress breathing difficulty, liver failure, and kidney failure;- and this condition is fatal. A doctor diagnoses Aspergillosis based on symptoms. 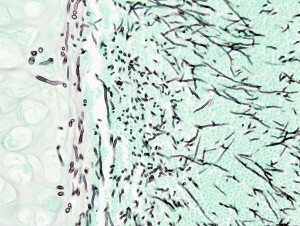 Infected tissue sample is obtained for culturing. It can take several days for the fungus to grow enough to be defined, but treatment should be started promptly, because such disease is dangerous. Burow’s solution consisting of aluminium acetate, is used to wash the affected ear canal. The fungus ball in the person’s lung is generally removed surgically. An antifungal medication, such as Amphotericin B, is generally given intravenously. Itraconazole and Ketoconazole are prescribed for oral use to treat a deeper tissue infection. 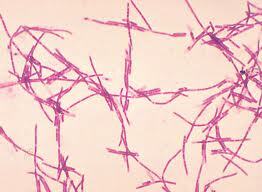 Certain Aspergillus strains , however, are resistant to such medications.